My introduction to sailing began at the ripe age of 5, receiving an Optimist Dingy during the holiday season. Though my initial reaction to my “present” were tears and it was years before I jumped into an actual boat, sailing has been in my blood from the get go. I began my career at age 8 in the Opti, winning the Women’s National Championship, finishing 3rd in the open Championship and representing the United States at various European and South American events. Highlights include winning the women’s division at the 700+ boat International Meeting at Lake Garda, Italy and winning the North American Championship in Trinidad and Tobago. Briana introduced me to the 470 my junior year in San Diego Bay over Thanksgiving break. Though we were able to train sporadically while in school, we knew once we graduated the Games were in our sights. Since going full time in September 2012, we have made many waves on the international 470 circuit. We have one goal, and only one: to bring home the Gold Medal for the United States in 2016. Born and raised in San Diego, Briana was attracted to sailing by family and friends at age 8. Her love for sailing grew exponentially as a member of the Point Loma High School Sailing Team where she helped the team to four national championships. While in high school, she also qualified to represent the USA in three ISAF Youth World Championships (2005,2006,2007), securing the Silver medal in Busan, South Korea in 2005 and finally capturing the ISAF Youth World Title in Kingston, Canada in 2007. Briana attended Boston College where she led the Eagles to 2 Co-Ed National Titles, 1 Team Race National Title, 2 Women’s National Titles, and 2 Fowle Trophies. She is currently training full time as a crew for Annie Haeger in the Women’s 470 in hopes of representing the USA in the 2016 Olympic Games in Rio de Janeiro, Brazil. 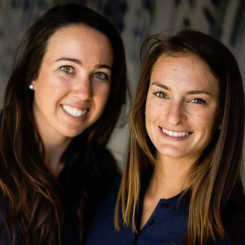 The duo is currently top five in the World and have made waves on the international 470 circuit as a top threat in the fleet.